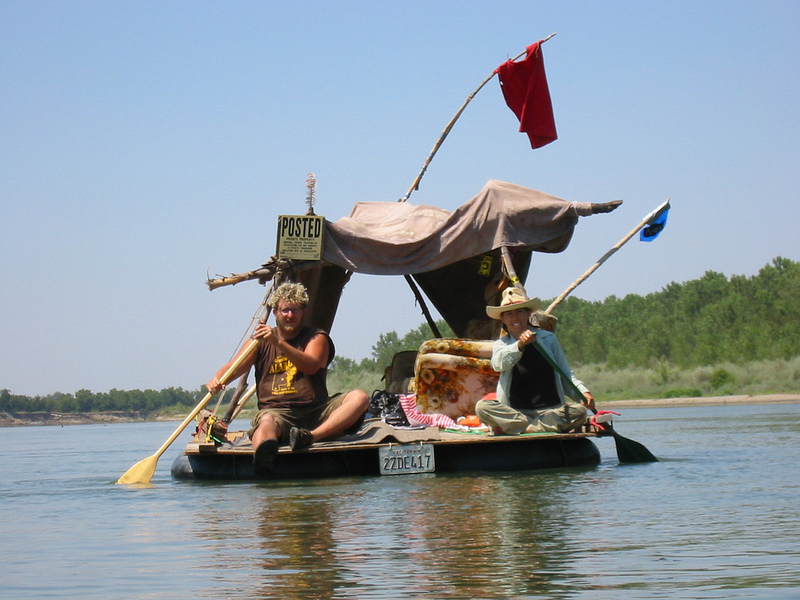 When we built punk rafts and floated several big rivers, we powered the rafts with canoe paddles and our own arms. Though the big innertubes that floated the rafts provided so much flotation, they drew no more than a few inches of water, it was still like pushing a truck. After a long day of avoiding Swirlies (eddies) and River Sharks (snags), we were exhausted. 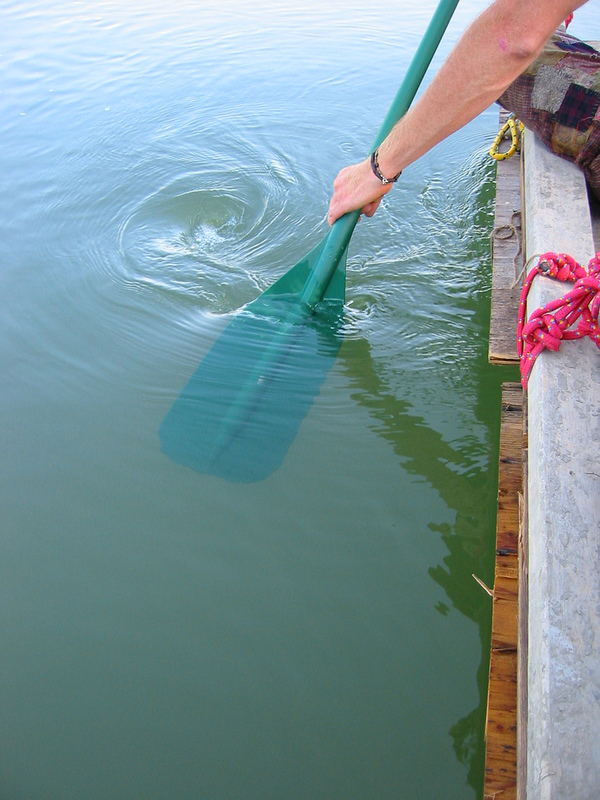 Since the raft had no keel or centerboard, it had nothing to provide lateral stability. So when we were going forward, we had to synchronize our rowing or else we'd be zigging and zagging all over the water, which we did plenty of anyway. As an aside, having no keel did have one advantage: We could rotate on a dime. So for example, avoiding an object in the water dead ahead, the Caller might call, "Okay, give me one easy backward stroke," while paddling forward herself to pivot the raft toward the hazard. 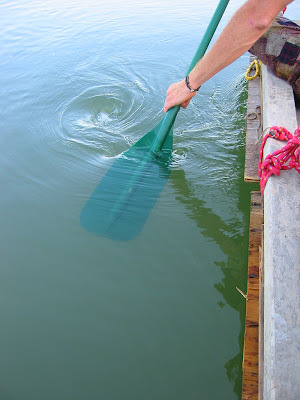 Then she'd call, "Okay, now give me three strong backward strokes," to put the raft out of the way of the snag. Facing the hazard forward thusly, we could always push off if we hadn't rowed fast or strong enough. In short, it was a big pain. And exhausting if we had to row any distance, for instance in still water. 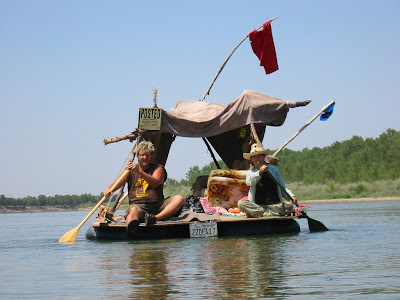 The plans for the shantyboat have long skegs (sorta like double keels) that run the length of the bottom of the hull. This gives the boat lateral stability when it is powered and keeps it from skipping all over the water when the boat is turned. The skegs had to be made out of a rot resistant wood that turned out to be hard to find in the lengths I needed. I ended up having to splice board together to make adequate lengths. They had to be bolted through the beautiful hull I'd just finished making watertight, and I was scared. I screwed up several times and had to redo stuff. I had inadequate tools for some of this work. It sounds like I'm making excuses, but it feels more like: "Haha, look how dumb I am, yet I still got it done." The plans called for any of a variety of woods, none of which the local lumber yard had in anything approaching the lengths I needed. White Oak, Yellow Cedar, Port Orford Cedar, a few other ones that are found on the East Coast. Ideally, I was looking for 16 foot lengths. But these are increasingly rare hardwoods that simply don't come in those lengths. I found a specialty hardwood vendor only a half hour away. They had the Port Orford Cedar and what they called Alaskan Yellow Cedar. Neither of these are actually cedar, but are cypress. For you botany nerds, Port Orford cedar is officially known as Lawson cedar or Chamaecyparis lawsoniana. Alaskan yellow cedar is Cupressus nootkatensis. "Can you get either of these trees in sixteen foot lengths?" "We get what we get." "I mean do you ever get 16 foot lengths? Can you order that length?" "We get what they bring us." O-kay. That didn't sound too hopeful. I knew if I had to, I could splice a longer length together. There was lots of frantic maths at the lumberyard trying to see what lengths gave me the most efficient use of wood. While still expensive, the Port Orford cedar was half the price of yellow cedar, so that decided it. This was expensive wood, so I wanted to make sure I got the best use out of it. I had to use the cedar for the bottom skegs, the fore skegs, the trim boards along the bottom side, and the edge boards all around the top edge. So I created a cut plan so that every bit of the wood was put to use. Then I spent days cutting and ripping and making lots of sawdust, sure that every cut I made was going to render this expensive piece of wood unusable. Next we'll talk about the splice that turned four shorter pieces of wood into two long 16 foot skegs.